Aboard the RMS Queen Mary on this day in 1938 were Mr. and Mrs. John Jacob Astor III*. The pair, after having spent several months in Europe, which included passing part of the winter in Switzerland, intended to stay at the St. Regis Hotel upon their arrival in New York City. 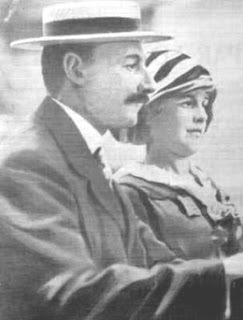 The elder John Jacob Astor [pictured with Mrs. Astor around 1912] perished on the Titanic; his wife, the former Madeleine Talmadge Force, pregnant with their son, survived the sinking. *Though in the 1930s press he was referred to as John Jacob Astor III, in reality, because of other relations with the same name, he was the J.J.A. VI and his father was J.J.A. IV. (The true John Jacob Astor III was born in 1822 and died in 1890).